Inside this little book you will find words that convey the thoughts and intentions of God, as heard and set down by the great prophets and visionaries of the Bible. 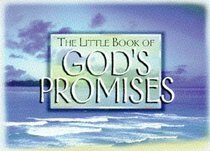 About "The Little Book of God's Promises"
Philip Law has compiled numerous collections of prayers and meditations, including The Wisdom of the Psalms, The Little book of Spiritual Wisdom, and Secrets of Peace. He is currently director of the United Kingdom division of Westminster John Knox Press.